Living in a home surrounded by forest is heavenly if your interest lies in wildlife, and ours does. Bird watching is always a pleasant way to watch the changes in the seasons. Robins passing through heralds the arrival of spring about a month before our northern relatives will celebrate their first sighting. Then the other birds arrive and spring gets underway with the birth of wild babies. 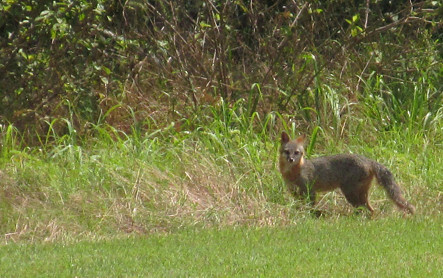 Foxes are the most visible, and the most entertaining. Once the kits are old enough to follow their parents about on hunting trips, things get interesting. Unusually, those of us in the house are glued to the windows, watching the antics of fox kits mimicking their parents. Right now we have four growing kits for frolicking around for our entertainment. The pasture behind the house is just one of their favorite playgrounds. They run as fast as they can, making mock runs at each other, then bugging whichever parent drew the short straw for babysitting. Chasing bugs or each other keeps them busy for a while. Using the jump their species is famous for, they practice catching mice or gophers, but it doesn’t appear they actually succeed. They even play on the bales of hay we have on the other side of the house. Someone has to go behind them and pick up the pieces of twine they managed to shred from the bales so it doesn’t get caught in the lawnmower. Nature can be the ultimate chill pill.